The evolution — the mere existence – of comic strip collections is a pretty curious phenomenon. Comic strips are the very definition of disposable pop culture; they are and almost always have been one-shot gag delivery systems designed to be forgotten five seconds after they’re read. The dramatic narrative strips of the action and soap-opera variety are even less worth collecting, not only because they’re badly written, but because they spend half their time recapping what happened in the last installment for lazy readers. The very notion of collecting such things seemed pretty ridiculous until a good five decades into the art form’s existence (which is particularly unfortunate, since some of the early strips, which were often quite excellent, were never preserved). This wasn’t so much a referendum on the validity of the art form as it was an admission that the strip form was just too ephemeral to merit the treatment. This began to change in the 1950s and 1960s, largely through the popularity of nationally syndicated strips and the subsequent marketing possibilities, another development for which every comics artist should be eternally grateful to Sparky Schulz. And it was Schulz who was the well-deserved subject of Fantagraphics’ now-legendary line of comprehensive strip collections; their gorgeously designed, lovingly curated collection of his Peanuts strips set the standard that everyone — themselves included — would have to match from then on. It’s a surprisingly hard decision to go all in with these sorts of collections; their positive qualities cannot be denied, but they’re also almost prohibitively expensive, and even comics fans with the resources to pony up $30 for every volume probably started to get a little leery by the time the material from the late ’70s and ’80s started appearing. Though a huge fan of the medium’s masters, I’ve had to refrain from pulling the trigger time and time again due to the expense and investment of time demanded by the Fantagraphics collections, but I knew the time was coming. The company had been promising for many years that they were only a few months away from releasing the first volume of the collected Pogo, but there were always unending delays. The lateness of the Pogo book became something of an industry joke, one which is fairly addressed in Pogo by Walt Kelly: The Complete Syndicated Comic Strips Volume 1 – Through the Wild Blue Wonder. Editors Kim Thompson and Carolyn Kelly (Walt’s daughter) explain that they simply didn’t want the collection to come out until it was the best it could be, and that meant preparing a huge amount of archival material, much of which had been believed lost until Carolyn unearthed it. Of course, any such collection lives and dies by the quality, readability and durability of the strips inside, and there’s a good reason why I exercised such patience in waiting for Wild Blue Wonder. 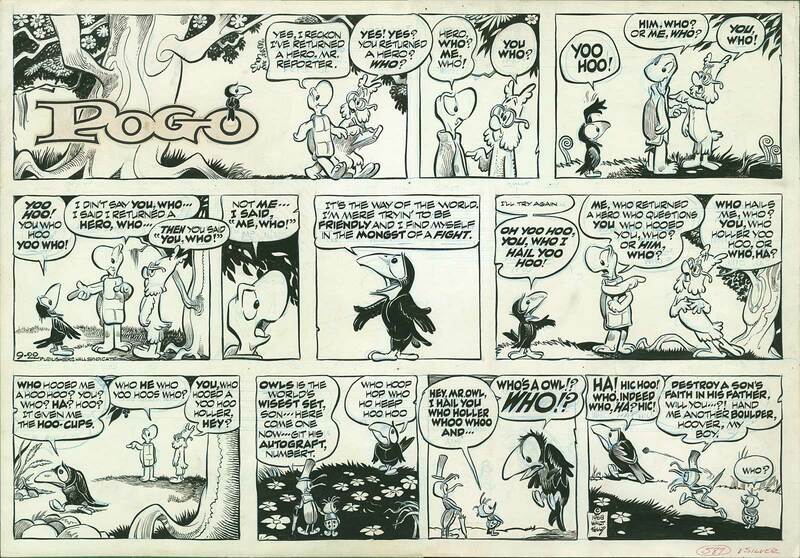 With all due respect to the likes of Charles Schulz, Bill Watterson, Garry Trudeau, George Herriman, and other great strip artists, Pogo has always been my favorite. Its art — influenced hugely by Kelly’s time as an animator for Walt Disney — is simply breathtaking; the facial expressions and body language in these strips are often deceptively simple, but they offer a master class in how to communicate emotion and expression in cartooning. Kelly’s brush lines are absolutely breathtaking, and get a well-deserved showcase in beautiful rough-sketch scans that break up the chapters. His backgrounds are lovely and provide a perfect balance to the detail in the character illustrations (as well as serving as a painful reminder of how much comic strips have lost by their constant shrinkage on the newspaper page). The medium is a big tent and can support all levels of craft from its artists, but Walt Kelly may have been the comics page’s greatest draftsman until the arrival of Bill Watterson. And Pogo‘s lettering is simply unparalleled; no one before or since has taken such pains, not only to make the text beautiful, but to integrate it into the very nature of the strip, using it to enhance the humor and deepen the characters. But what puts Pogo way, way over the top in terms of sheer audacious greatness isn’t its art, great as that is. It’s Kelly’s remarkably eclectic writing and inventive use of language that makes the strip. The greatest writers in every medium were in love with language, drinking in its possibilities and letting it flow back out of them in unexpected and clever ways, and Kelly is no exception. He threw every kind of linguistic expression into Pogo‘s gumbo pot: poetry, ballads, popular song, newspaper jargon, technical language, advertising argot, and, of course, the perceptive yet absurd mish-mash of Southern dialects spoken by his characters. Kelly was a Yankee through and through, and the dialect of Pogo and his pals is no more meant to be a true Southern accent than the setting of the strip is a realistic depiction of the north Georgia swamps. But he had a tremendous ear, and he managed to whip the dialects of Cajun country, the Old Dominion, the New South, and other nooks and crannies of Confederate country into a blend that was entertaining enough on its own, but when combined with the humor of the strips, was absolutely hilarious. The humor Kelly used was also nearly impossible to describe, but joyous to experience. He found himself too limited by the simplicity of funny-animal gag strips while working at Dell; when he started Pogo, he stuck with the format, which he loved, but expanded the approach to include political satire, character-based humor, cartoonish slapstick, elaborate linguistic puns, and most of all, a jaundiced look at human nature that can only be achieved through the means of placing it in the mouths of animals. The material collected in Through the Wild Blue Wonder is the earliest Pogo stuff, so it features relatively little of the biting political material that would be a highlight of later strips, but there’s still at least half a dozen varieties of humor on display here. Kelly never lost sight of his great passion for making kids laugh, so he still manages to pack in plenty of goofy slapstick that will still appeal to the young ‘uns today; but he was also trying to amuse himself, and his sense of humor was decidedly dark when it came to human nature. These early strips feature plenty of his cynical takes on favorite targets like the justice system, the newspaper trade, the hucksterism of salesmen and advertisers, and possibly tops on his hit list, the idea that technology is improving the human race. For these strips, he usually employed the character of Howland Owl, the half-baked pseudoscientist of the Okefenokee Swamp — who, in the first volume, is memorably charged with developing atom bomb technology. Kelly’s characters were no deeper than the water in their native marshes, but he expertly employed them as archetypes: the misunderstood misanthrope Porky Pine, forever unable to make himself understood (he submits his tragic life story to the local newspaper, which runs it as a comic strip), the overenthusiastic Albert Alligator and his frequent partner, the easily manipulated turtle Churchy LaFemme, and the self-aggrandizing hound dog Beauregard Bugleboy are all perfectly used in showing how people get caught up in their own enthusiasms and are apt to blame everyone but themselves for the vagaries which keep them from getting what the want. The self-serving fraud of a priest, Deacon Mushrat, appears sparingly here, and isn’t quite the moralizing hypocrite he would become in later years; his role as villain is largely filled by snake-oil salesman Seminole Sam. But the essential set-ups are all here, ready for Kelly to start making his endlessly repeated observations on the way fools engineer their own downfall — a topic that was of no small relevance in the America of the 1950s.